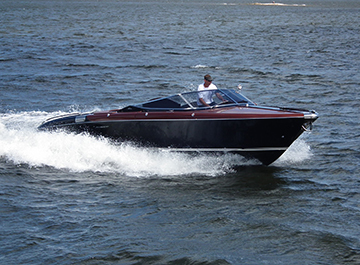 Boats powered by Inboard/Outboard motors present a particular challenge – especially in smaller, open vessels, because seating areas are often next to or right on top of the engine. The compact size of the engine compartment leaves less room for treatments, so options are more limited than on larger boats. However, the proximity of passengers to the engine is also why effective quieting is so important. The treatments below have proven effective on boats of this type. Each treatment description starts with the type of noise, explains the path it follows, includes recommended materials and tips to make noise remediation as successful as possible. We’ve also included a few techniques for identifying problem areas. Problem: On an I/O vessel, insulation of the machinery is critical because the engine is the biggest source of noise. Solutions: Insulating the engine box with Soundown Vinyl/Foam will greatly reduce noise transmission. The treatment area should include the engine hatch as well as any of the surfaces that are exposed to the engine on the sides or the cockpit. 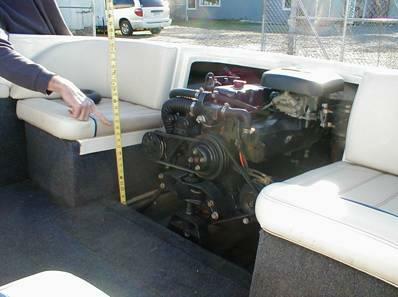 This includes areas outboard of the engine and behind the seats (see the picture above). Because space inside the cover is typically limited, we recommend our 1” 1lb material. If space allows, 1.5” or 2” will provide even better results. should also not be overlooked – make sure that when the box is closed, the seal is tight. You can double check by closing the box and trying to fit a business card between the box and the deck. 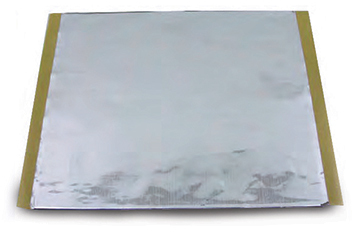 If you can slide the card between the two surfaces, noise will leak out at that seam. Choosing one of Soundown’s many gasket profiles will create a secure seal to prevent noise from leaking. is another important step. Often control cables and wiring are run through holes in the bulkhead or engine box. These holes also allow noise to leak out of the machinery space. Soundown’s EcoDamp is a thin, self-adhesive viscoelastic material that can be easily formed around wires or piping to seal these holes. Note: your engine does require vents to provide air for combustion and cooling, these should not be sealed up. However, if they open into the cockpit we suggest making a baffle. The baffle should break the line of sight from the engine to the cockpit with one or more 90 degree turns. Problem: Energy – which becomes noise – is transmitted to the hull through the engine mounts and drive assembly. Ultimately, this structureborne noise radiates into the cockpit. Solution: Most inboard/outboard engines are close-coupled to the outdrive. In these cases we do not recommend changing the factory engine mounts because there is a risk of damaging the interface between the engine and gear. For vessels with a jack shaft between the outdrive, improved engine mounts are recommended. Solution: With or without custom mounts, adding damping material to the transom will absorb some of the engine and higher frequency gear vibration before it can transmit through the boat. The recommended damping sheet is ¼” thick and needs to be epoxied directly to the transom in the area around the gimble housing. This treatment does not need to be continuous, but, does need to cover as much of the transom as possible.